The struggle is real when you have fine hair: On a great day, you're lucky if it can hold a single curl, doesn't fall flat by midday, and isn't already a grease ball by 3 p.m. But there are styles any fine-haired lady can keep in her pocket to make sure that at least her cut is built to create the impression of texture and body. Work your natural assets with these hairstyles, ahead. Of course Kristen Stewart, the queen of cool-girl styles, rocked this edgy shortcut the best way. Her deep side part graced one side of her hair with so much volume. To trick the eye with faux volume, all you have to do is tuck the other side of your hair behind your ear, and take a flat-iron to recreate this fluttery texture. This crown braid swept into an updo looks like it was made for Lucy Hale. She's a boho princess in this elegant style. And is that a flower I see peeking in the back? Gorgeous. Updos are not only photogenic if you have a fancy event on your calendar, but they're ideal for fine hair because the style adds so much shape and structure. Nina Dobrev proves you can absolutely make your hair's mis-matched length look so chic. Asymmetrical cuts are in: It basically allows one side of your hair to borrow more weight than the other, which in turn means TEXTURE. You don't even have to try hard either. For a beachy style like this, you need a salt texturizing spray, which will do most of the work for you. You may need to take a flat-iron to style a few of your pieces in the front, then scrunch the ends for even more of an effortless finish. Headbands will take your hair from pretty to absolutely regal. 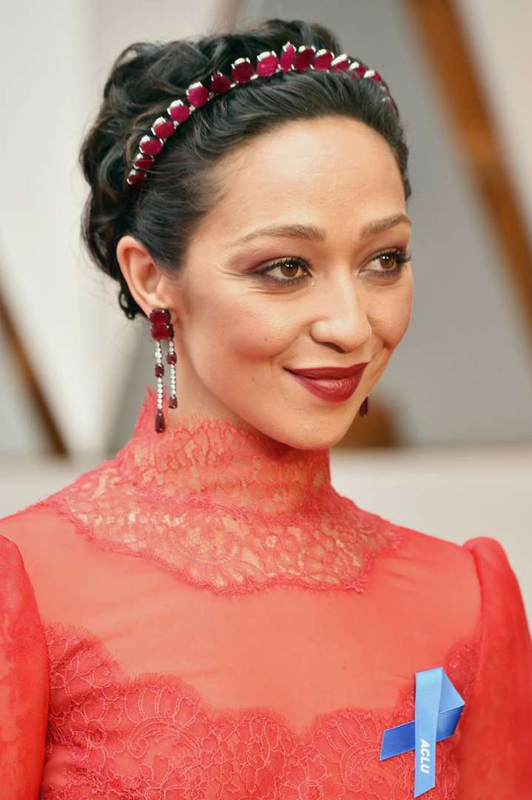 Exhibit A: The one and only Ruth Negga at the Academy Awards. The actress has natural gorgeous curls, but adorning them with this bejeweled headband added such an elegant touch to her texture. Cameron Diaz is completely owning this easy braided style. There's absolutely nothing wrong with taking things back to the basics with a good old-fashioned braid, but what truly elevates this style is the loose ends falling so perfectly in the front. Allow them to hang freely in the front, and sweep the rest of your hair back into a loose braid fastened by a hair band to keep it from unraveling. Use a mini flat-iron to add a few bends if you want. If your hair is on the longer side, you can always go the classic route, like Zoe Saldana, and add glamorous curls. Try trimming your hair by adding subtle layers for face-framing curls. At first glance, Beyoncé's "Get Me Bodied" lyrics came to mind, because this bob has all the body. This style makes it hard to believe that Julianne Hough naturally has fine hair. The combination of her cut, color, and style does the actress' gorgeous features justice. Bangs add dimension to any hairstyle, no matter your texture. To get your lob to look as spacious as this, simply take a rounded brush and tease your hair-focus on your roots to lift your hair as much as possible. There's nothing a cool color can't do for your hair. Coating your hair with a color of your choice is an easy distraction; everyone will be too busy complimenting you on your hair color, rather than your texture. Be sure to consult a professional colorist to figure out which shade will suit your skin tone best. 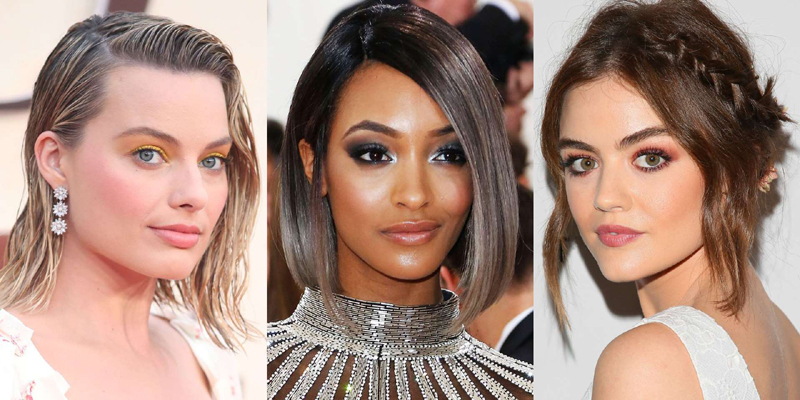 Jourdan Dunn was a walking goddess at the Met Gala with this cool-toned, silver hue. Try to take your attention off of Ruby Rose's badass plum lipstick for one moment and focus on her hair. Slicking one side of her short cut down and styling the other side with feathery bends breathes a whole lot of life into her fine strands. Fine hair hack: Deep side-parts are your friend, if you want volume. Styling your hair like you literally just stepped out of the shower is a vibe. I like to call this style Lazy Girl 2.0. The lovely Margot Robbie wore this stunning wet style on the red carpet, which illustrates how transforming your texture lends so much body to limp strands. Rake a bit of Dream Coat Color Wow's Anti-Humidity Hair Treatment ($28), which happens to be Kim Kardashian West's go-to for those iconic sleek ponytails of hers, through your hair for frizz control and to amplify your glossy shine. This one's a classic mainstay look for fine hair. The only downside is that this look often gets boring- try parting your hair on different sides and blow-drying your hair upside down for some added volume at the roots. Or, for an easy update to long strands, simply wrap your ends around a barrel iron for this swirling curl effect (see: every Kate Middleton photo ever for the full effect). This style works especially well on next day hair. Add some dry shampoo at the roots for extra lift. A half-updo is an especially elegant way to break up long, fine hair and doesn't require much time or effort. To recreate this satiny effect, use shine-boosting products (or a great conditioner) and smooth over any fly-aways with a flat iron. One easy way to add texture to fine hair is a shorter cut. The bob is a classic face framing shape that you can subtly add lift to by round-brushing the ends. It's also the perfect length for going to town with a straightening iron or hot tool. It'll only take 10 minutes to create a head full of beachy waves. The rounded lob can be hit or miss depending on how you style it, because sometimes the length can fall flat. Lobs tend to look better on thicker, fuller hair with natural body and texture. To recreate more body, blow dry hair at the roots and round-brush the ends inward for greater volume, or wrap your strands loosely around a hot tool for a slightly wavy effect. One major perk of having fine hair? It looks killer in wispy, piece-y pixie cuts. The soft, light texture of fine hair gives it a gentle feathery quality, but beware of teeny fly-aways. Investing in a pliable wax product to style and keep your hair in place is crucial for maintaining an ultra-short cut on fine hair. Fine haired people only dream of having this texture naturally. Recreating it requires some extra maintenance, but it's always worth it to add a little texturizing spray and spend some time with a hot tool on special occasions. You'll probably need to use a higher temperature for your curls to hold, so spritz on a heat spray beforehand so your hair doesn't suffer any lasting damage. To ensure that your hair has more hold, try curling hair on next-day hair. If your greatest struggle every day is a limp ponytail, lean into your natural texture (without zheuzhing and puffing it up) by trying a thin "braided" ponytail instead. You can use the teeny clear elastic bands to section off hair into a braided replica like this one. But if you *do* want a weightier ponytail, you can use a texturing product on your hair, lift your hair at the roots, and spritz with hairspray. To make the rest of your hair appear fuller, try wrapping the ends of your hair around a curling iron for this gorgeous wavy look or invest in some extensions. It's also crucial to prop up your ponytail if it's prone to falling flat, so secure your ponytail with not one, but two elastic bands in a row. Jennifer Aniston is more famous for her layered "The Rachel" than any other hairstyle, and she's continued to style her hair in similar layers throughout her career. Why? Layers work super well on fine hair to give it shape and body. Instead of a flat curtain of hair, you've got plenty of gorgeous layers to style and work with.